When I get invited to present at conferences and give talks, I frequently have to provide a bio – here is a selection, in increasing order of self-congratulation, that conference organizers can choose from, as well as a photo (click for full sized version). Henry Farrell is professor of political science and international affairs at George Washington University. He works on a variety of topics, including democracy, the politics of the Internet and international and comparative political economy. He has written articles and book chapters as well as two books, The Political Economy of Trust: Interests, Institutions and Inter-Firm Cooperation, published by Cambridge University Press, and (with Abraham Newman) Of Privacy and Power: The Transatlantic Fight over Freedom and Security, forthcoming from Princeton University Press. Henry Farrell is professor of political science and international affairs at George Washington University. He has previously been a fellow at the Woodrow Wilson Center for International Scholars, assistant professor at George Washington University and the University of Toronto, and a senior research fellow at the Max-Planck Project Group in Bonn, Germany. He works on a variety of topics, including democracy, the politics of the Internet and international and comparative political economy. His first book, The Political Economy of Trust: Interests, Institutions and Inter-Firm Cooperation, was published in 2009 by Cambridge University Press, and his second, (with Abraham Newman) Of Privacy and Power: The Transatlantic Fight over Freedom and Security, is forthcoming from Princeton University Press. In addition he has authored or co-authored 34 academic articles, as well as several book chapters and numerous non-academic publications. He is a member of the Council on Foreign Relations. Henry Farrell is professor of political science and international affairs at George Washington University. He has previously been a fellow at the Woodrow Wilson Center for International Scholars, assistant professor at George Washington University and the University of Toronto, and a senior research fellow at the Max-Planck Project Group in Bonn, Germany. He works on a variety of topics, including democracy, the politics of the Internet and international and comparative political economy. His first book, The Political Economy of Trust: Interests, Institutions and Inter-Firm Cooperation, was published in 2008 by Cambridge University Press, and his second (with Abraham Newman) Of Privacy and Power: The Transatlantic Fight over Freedom and Security, is forthcoming from Princeton University Press. In addition he has authored or co-authored 34 academic articles, and numerous book chapters for edited volumes. He is a co-founder of the popular academic blog Crooked Timber, and also blogs at The Monkey Cage, which is currently hosted at the Washington Post and winner of the 2010 The Week award for Best Blog. He has written articles for publications including Foreign Affairs, The New York Times, The Financial Times, Foreign Policy, Democracy, The American Prospect, The Washington Monthly, The Boston Review, The American Interest, Aeon, New Scientist, The Nation, The Chronicle of Higher Education, Times Higher Education, and the Australian Academic Supplement among others. He is a member of the Council on Foreign Relations, a non-resident senior fellow and associated researcher at the Conservatoire National des Arts & Métiers Security and Defense Hub, an international correspondent for Stato e Mercato, co-chair of the Social Science Research Council’s Digital Culture initiative, and an affiliated scholar at Stanford University Law School’s Center for the Internet and Society. Henry Farrell is professor of political science and international affairs at George Washington University. He has previously been a fellow at the Woodrow Wilson Center for International Scholars, assistant professor at George Washington University and the University of Toronto, and a senior research fellow at the Max-Planck Project Group in Bonn, Germany. He works on a variety of topics, including democracy, the politics of the Internet and international and comparative political economy. 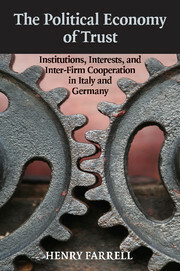 His first book, The Political Economy of Trust: Interests, Institutions and Inter-Firm Cooperation, was published in 2008 by Cambridge University Press, and his second (with Abraham Newman), Of Privacy and Power: The Transatlantic Fight over Freedom and Security is forthcoming from Princeton University Press. In addition he has authored or co-authored 34 academic articles for journals including International Organization, World Politics, Comparative Political Studies and the Annual Review of Political Science, as well as numerous book chapters for edited volumes. Professor Farrell is a member of the Council on Foreign Relations, a non-resident senior fellow and associated researcher at the Conservatoire National des Arts & Métiers Security and Defense Hub, a Foreign Correspondent for Stato e Mercato, co-chair of the Social Science Research Council’s Digital Culture initiative, and an affiliated scholar at Stanford University Law School’s Center for the Internet and Society. He is a co-founder of the popular academic blog Crooked Timber, and also blogs at The Monkey Cage, which is currently hosted at the Washington Post and was winner of the 2010 The Week award for Best Blog. He has written articles for general publications including Foreign Affairs, The New York Times, The Financial Times, Foreign Policy, The National Interest, The American Prospect, The Washington Monthly, The Boston Review, The American Interest, Democracy, New Scientist, The Nation, Aeon, The Chronicle of Higher Education, Times Higher Education, and the Australian Academic Supplement among others.